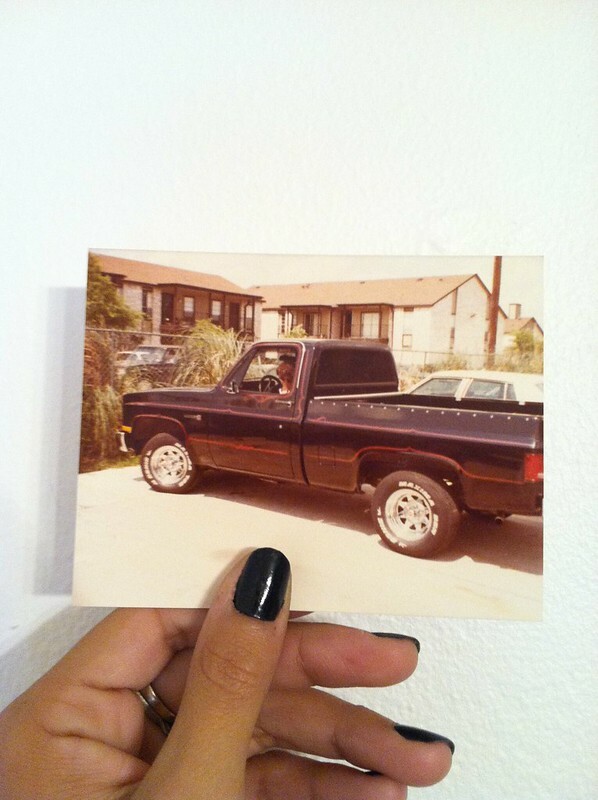 I'm not sure when I came to be the owner of this photo or when, but at some point in time this photo of my Pops sitting in his old truck made its' way out of the ol shoebox and into my possession. This photo lives on the top ledge of my sewing table. The other night my pops caught a glimpse of it and said 'Holy crap, is that my old truck?' Apparently, he'd never even seen this photo. I guess it was just one of those photos that my mom snapped, developed and put in a shoebox for all these years. Again, I have no idea how this photo made its way to me, but here it is. My Pops told me this was the truck he owned when he was twenty-five and it was his first and only new vehicle that he's ever owned to this day. Over and over he repeated 'Oh man, I loved that truck...' I was just born, Brandi was six, and my parents were moving us to Colorado from Houston, Texas. Everyone kept telling my pops that the truck was an awful vehicle for colorado and all the snow. So after hearing that from enough folks he let fear take over and he sold his love for a 'dang family van'. haha. While he was holding this photo in his hand shaking his head and laughing he said he even bought the rims separate and took it in to be 'pimped out'. You see all those pin stripes? Yep, my Pops took the truck to an old shop, down the road from where he grew, up in Sharpstown to a cross eyed fella named Milburn. Pops watched Milburn do most of the stripe work free hand. It was weird watching my Pops react to a photo of his life that he had never seen and re live and tell the story as if it just happened. I have a terrible memory and I don't think of myself as a good story teller, but I hope one day I can offer little family history stories here and there to my kids one day (you know, if that ever happens). It was also weird to think, my pops was 25, married with two kids and moving a family to another state. I'm 25 with half of my life in a single bedroom, the other half in storage, in love, a passion for design and travel, and living completely different. I can't even imagine making choices like giving up a vehicle that I love for the safety of my family. I mean, of course I would do that, but to think of making those kinds of choices and sacrifices at this point in my life is foreign. While pursuing dreams, it's easy to get tunnel vision and make decisions only for yourself, so hearing little stories like this help keep me grounded and to remember to make good decision and to keep in mind the ones I love. I admire my Pops and when he tells me stories of his life, that grows. I want to be that person for my kids too. I admire 25 year old him. I hope they'll admire 25 year old me. Thank you for all the comments, I've loved reading them! Paul asked what my Pops drives now... well after a long list of used cars (most without ac) he's still putting miles on a '97 GMC Sierra pickup. Boy, is that thing a site. It's been hit by un insured Houstonians a few times and the passenger door doesn't open from the inside, so Pops has to open the door for who ever rides with him. I love it. I think my pops will ride it out until it's completely dead, then who knows what's next.